Maine brewers did our state proud at the Great American Beer Festival (GABF) awards, which were handed out this past weekend in Boulder, Colorado, and is the largest commercial beer competition in the world. This year 1,532 breweries entered a mind-boggling 6,738 beers. Wow. We here at Portland Old Port would like the festival organizers to know that we are always available for judging duties, FYI. Beers were judged and prizes awarded in 92 categories, covering 145 different beer styles. And the biggest winner: Maine, based on ratio of medals to entries. 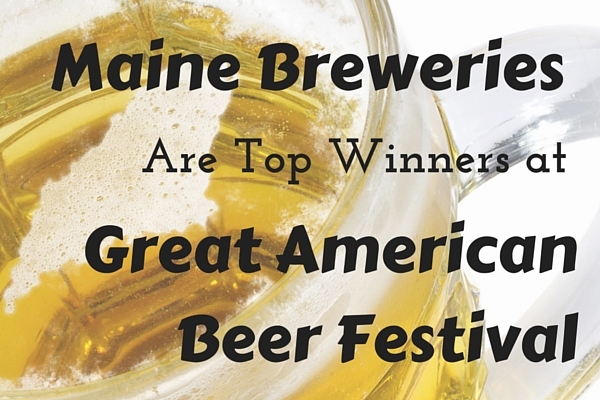 Maine brewers won medals in 21% of the categories entered, with 14 entries and three medals. The next closest state was Rhode Island, with a winning ratio of 10% (10 entries, one medal). So basically New England is crushing it in the beer world these days. Our winning breweries are Allagash Brewing Company, which won a silver medal for Allagash Tripel, a Belgian-Style Tripel, and a coveted gold medal for their flagship beer – Allagash White, a Belgian-Style Witbier; and Baxter Brewing Co., which took home a silver medal for the Window Seat Coconut Almond Porter, a Field Beer. If you are curious, you can check out the full list of winners here. Cheers to Maine beer, and to continuing to show the rest of the county that Maine may be small in terms of population and number of breweries, but is truly world class when it comes to brewing. Rebecca Hosley is a long-time Portland resident and professional gadabout. She is a trivia ninja and connoisseur of local beer and spirits. When not enjoying the amazing food and beer scene of Portland, she can often be found playing tennis or disc golf.